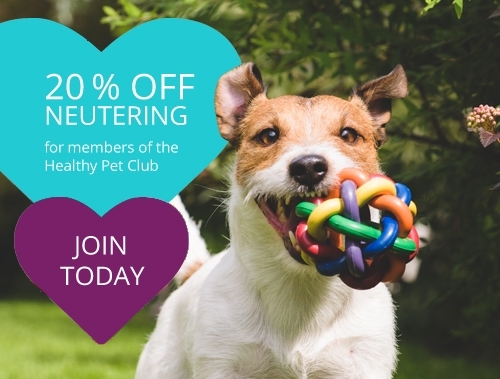 The Healthy Pet Club is part of CVS UK Ltd.
* Sample savings based on average prices charged across a sample of 25 practices. Benefits received under the HPC loyalty scheme include: initial vaccination (including Kennel Cough), year’s flea and worming medication, microchip, 20% off neutering, 20% off selected lifetime medication, 10% off products & services, 20% off wellness test and unlimited nail clipping. The cost of purchasing these goods and services separately would result in an average annual savings of up to £200 (or more for larger breeds). Benefits, costs and savings vary depending on the type and size of your pet.